Brief History of the Synchrophase - Alfred H.Grebe was born in 1895 and started in the "radio business" at a very young age. He was certainly selling various pieces of equipment he built to radio amateurs prior to WWI, he supplied a "submarine receiver" to the Navy during WWI and continued on building amateur radio receivers after WWI. Grebe produced a series of ham receivers designated with a "CR" prefix followed by a number to identify the model. The CR receivers were very popular with the hams and, if a commercially built receiver is seen in a vintage photograph of an old ham station, it will more than likely be a Grebe "CR" receiver. 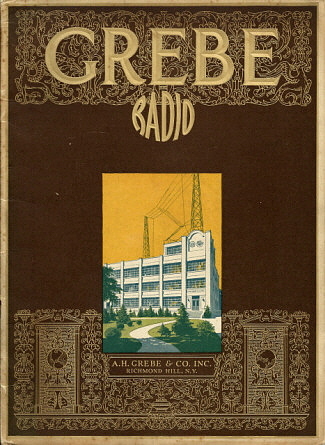 The amateur business was large enough that, by 1920, Grebe had a fairly large building for radio manufacturing. The A. H. Grebe & Co., Inc. was incorporated in January, 1920. When Westinghouse started their commercial broadcasting station, KDKA, in November, 1920, the general public became aware that "RADIO" could be more than the dots and dashes of International Morse. Prior to professional commercial broadcasting, 99% of what was on the air was in International Morse. The general public's opinion was "why buy a radio, I don't know Morse." Broadcasting was beginning to develop through 1921 and by mid-1922, there were over one hundred licensed "commercial" broadcasting stations on the air. The Broadcast Boom created an insatiable market for radios,...any radios. 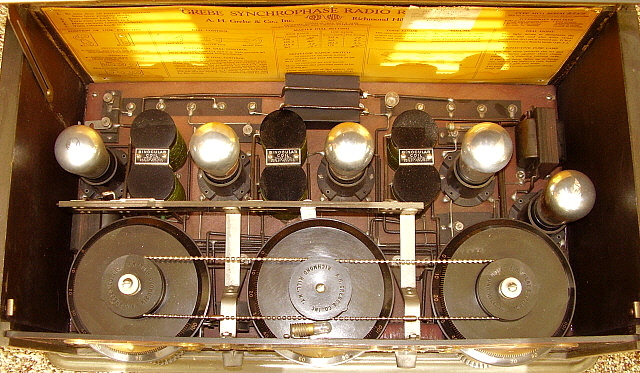 Radio receivers that had previously been for radio amateurs were sold as broadcast receivers. Old radio companies like Kennedy, Adams-Morgan and others, that were primarily ham or experimenter builders, offered their radios as broadcast receivers. 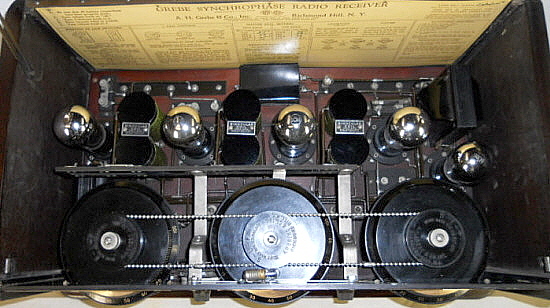 photo above: The Grebe CR-5, a single tube receiver from 1922. Many accessories could be purchased from Grebe to improve the performance of smaller receivers like the CR-5. Grebe marketed some of their CR receivers as broadcast receivers since they did tune around where the BC stations were transmitting. 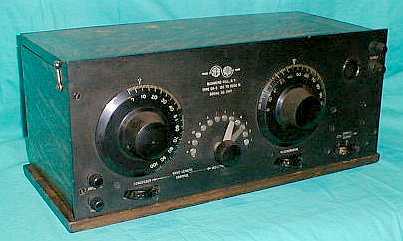 The CR-9 was the most popular early Grebe CR receiver since it included a two-stage audio amplifier section in addition to the regenerative detector. Additionally, Grebe later offered the CR-12 and the CR-14 as Broadcast Receivers but they still retained the round black dials and the same circuit of the earlier CR receivers, that is, regenerative detectors with a couple of stages of audio amplification. By 1924, there were hundreds and hundreds of companies building radios. Many of the radios produced were basic designs that functioned adequately but were not innovative since the companies were small owner-engineer operated concerns that didn't have the financial ability to become competitive. Grebe however was already a major manufacturer and, in early 1924, it was decided that a radio specifically designed for Broadcast reception was something the company should provide to the radio enthusiasts. The Synchrophase was born out of Broadcast Boom but was really not marketed during that period which ended around the beginning of 1924. 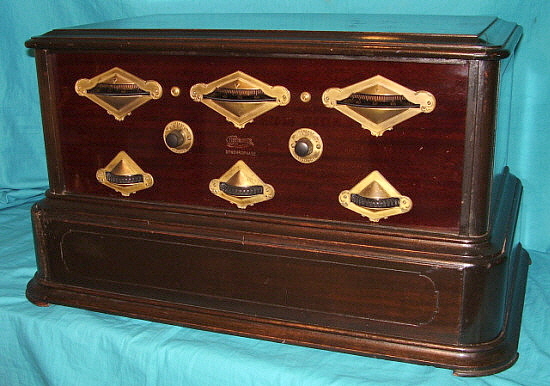 By mid-1924, radio buyers wanted great performance and easy operation. Grebe had some top engineers that designed a receiver that was made up of innovative components rather than a special circuit. Grebe components were built at the factory. They had their own bakelite molding facilities, their own screw machines, plating facilities, everything required to build first-class equipment. The new Synchrophase's mechanical superiority was due to the experienced manufacturing ability of the Grebe company. Then there was the styling. The Synchrophase had to look like no other radio. 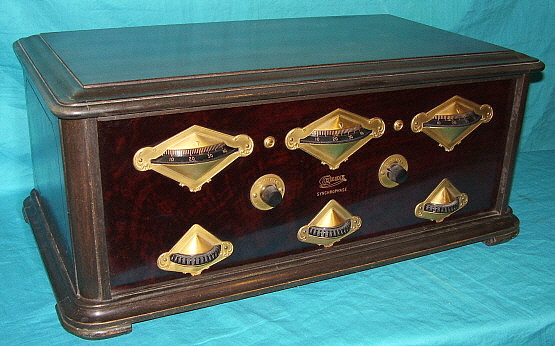 Grebe went for mounting the tuning condensers facing upwards with "on edge" dials that were surrounded by dull 24K gold covered and lacquered diamond-shaped escutcheons (early models only.) When mounted on the faux grained dark red mahogany bakelite panel the effect was mildly Oriental in style but certainly striking and looked like no other radio on the market. Finally, there was the performance. The new Synchrophase literally was the best performing non-superheterodyne radio available in 1924. It was one of a few TRF designs that could complete with the Westinghouse-GE-RCA superhet receivers. Amazingly sensitive and very selective, easy to operate and incredibly good looking - all for $155. The Synchophase was so popular, it was available from around August 1924 up to the summer of 1927. Probably over 150,000 Synchrophase MU-1 and MU-2 receivers were built during that period. An incredibly long production life considering the rapid evolution of radio designs during the 1920s. The Synchrophase Circuit Design - The Synchrophase is a Neutrodyne, no doubt about it. Look at the schematic and you'll notice the feedback capacitors (Grebe called them "balancing condensers") from the plate to the grid on the two RF amplifiers. 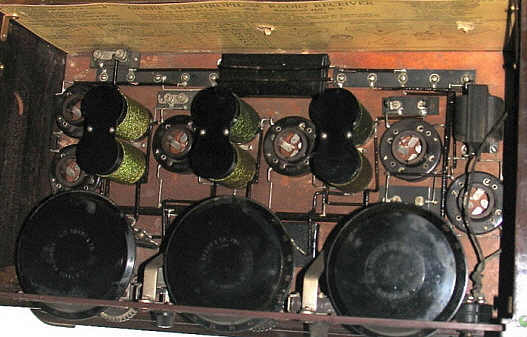 The only problem was the Neutrodyne circuit was owned by the Independent Radio Manufacturers who had paid Louis Hazeltine to design it exclusively for them. So, here was Grebe, not an IRM member (unless you were one of the eleven founding companies, you couldn't be a member) and he was building a Neutrodyne. The law suit was inevitable but Grebe production was never stopped. Eventually, Synchrophase production reached 150,000 radios before the court even heard the case in June,1927. By that time, the Synchrophase was already obsolete. Grebe lost the case but was able to obtain a Neutrodyne license anyway. But, so much for the legal story. Now, on to the circuit innovations. 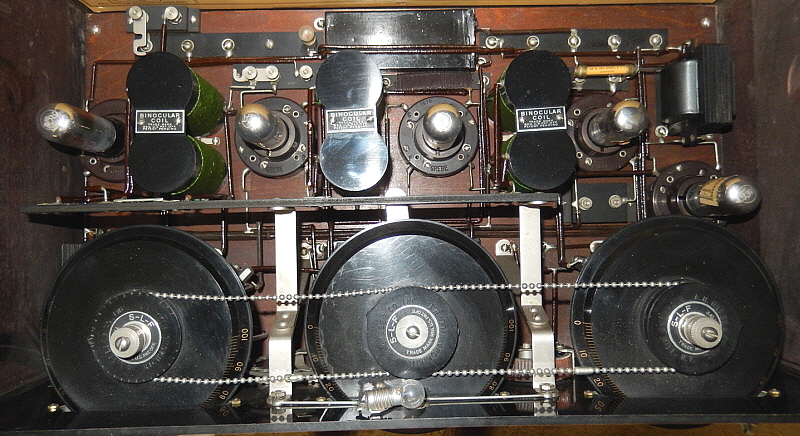 As stated in an April 1925 QST article by Ralph Batcher, one of the Grebe designers, it wasn't so much the circuit as it was the unique, precision components that made the Synchrophase such a great performing receiver. First were the "Binocular Coils." These were wound with Litz wire and then the RF impedance was checked to make sure all the wires of the Litz cable were correctly soldered. DC resistance checking would not show complete connections. 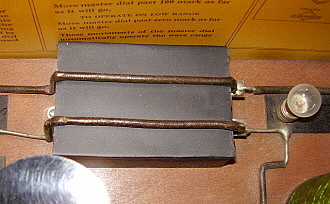 The dual coils were connected to cancel the field and prevent coupling. Also, the primary was wound with very fine gauge wire (~40ga.) that allowed more turns and the primary was mounted inside the secondary to allow the field to act as a shield. The binocular coils provided the intra-stage isolation needed for the Neutrodyne RF stages to function without adding stray coupling to the RF amplifiers. 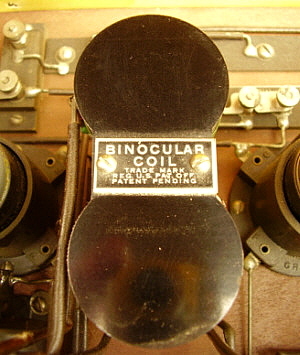 The Binocular Coils were designed by P. D. Lowell. The tuning condensers were very small due to the high inductance value of the binocular coils. In 1924, the Grebe tuning condensers were the smallest value found in production radios. Additionally, the cut of the plates allowed for a Straight-Line-Frequency change per the inductance used in the tuned circuit. This was found experimentally in the Grebe labs and resulted in a sort of square looking plates on the condensers. The end result was even spacing of the stations across the tuning range. The S-L-F condensers were designed by Ralph Batcher. Most battery sets of 1924 controlled their output level by increasing or decreasing the tube filament voltage. More sophisticated radios might split the function to have many filament controls so the circuit could be adjusted for every signal type. Grebe decided that the filaments could be set at some reasonable level and the actual volume of the audio controlled in another manner. The Synchrophase uses a variable resistive shunt across the primary of the second audio interstage transformer to act as a volume control. As "RADIO" evolved through the mid-1920s, so did the Synchrophase. The 1924 models are very different from the 1927 models. Although they appear almost identical on the exterior, inside the circuit kept up with the quick evolution of radio circuits during the twenties. Consequently, users today will find that the later Synchrophases are much better performers than the early versions. Later versions have a very wide tuning range, dial lamp, fuse, low frequency audio transformer, non-microphonic sockets and audio power galore. So, even though they appear the same on the outside, inside the variations of the Grebe Synchrophases offer a continual look at the evolution that was necessary to stay competitive in RADIO during the 1920s. The first version of the MU-1 has individually operated tuning condensers. 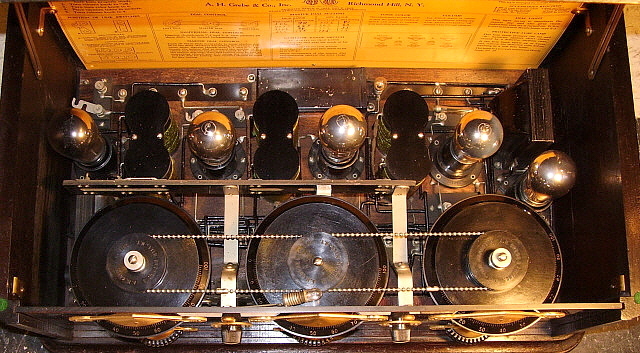 The dials are scaled 0 to 100 with gold-filled nomenclature. Each dial has a small vernier adjustment wheel directly below the dial at the bottom of the panel. The typical early MU-1 will tune up to just over 1300kc. Taking into account that most collectors know that the later MU-1 had "chain-coupled" dial drives, these early versions are sometimes referred to as "No Chains" or something similar. The "No Chains" versions were built for almost a year - probably from August 1924 up to mid-1925. 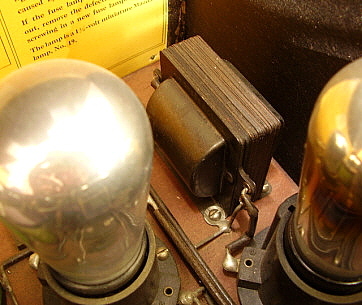 The article published in April 1925 QST shows the early version of the MU-1 and makes no mention of any improvements planned so our assumption is that the early version was produced up to around the middle of 1925.
photo above: The VOLUME control is a stepped resistive shunt across the second AF interstage transformer primary. The Volume Control is a variable resistance shunt across the primary of the second audio interstage transformer. Five wire-wound resistors are used in a six-position contact switch, stepped-control arrangement. The first schematics of the MU-1 show a continuously variable resistor rather than the stepped-control, however, it's unlikely that a continuously variable resistance (alone) was used since it would be possible to effectively short circuit the primary and allow the +90vdc battery to be connected to the 1AF plate without a load. The highest position contact is not connected to the shunt. This effectively allows the highest position of the Volume Control to disconnect the shunt from across the primary of the second audio interstage transformer. Additionally, there is a series resistance that limits the minimum shunt value to approximately 300 ohms. The very earliest Synchrophase receivers had small round escutcheons for both the Filament and the Volume controls. These early escutcheons are marked only with "INCREASE" and an arrow. The Instruction Card under the lid let the users know that the right hand control was the FILAMENT adjust and the left hand control was VOLUME. In fact, the Instruction Card shows the escutcheons with just INCREASE on them. photo above: Grebe MU-1 CTPB shows the early version chassis layout. Note that both audio interstage transformers are identical in size and ratio. Normal DC resistance is 330 ohms for the primary and 6600 ohms for the secondary. Both bypass condensers are very long metal case units painted gloss black. Early to mid-production routes two buss wires over the B+ bypass condenser. The C- bypass condenser can just be seen mounted under the central tuning condenser. 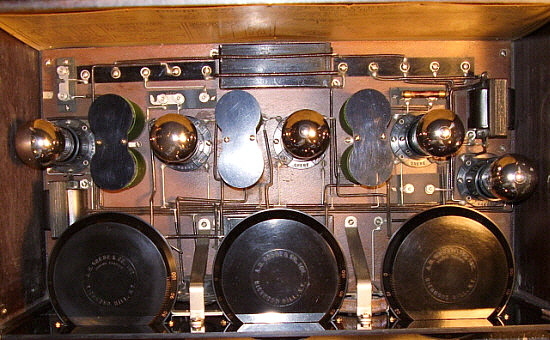 Note that early receivers do not have "Binocular Coil" labels mounted on the top covers of the coil assemblies. These are photographs of the early versions of the escutcheons for the FILAMENT and VOLUME controls. To the left is the first escutcheons used. Both are identical and only have INCREASE between an "arrow" indicator. The Instruction Card told the users which control did what. The two photos to the right show the next escutcheons used. 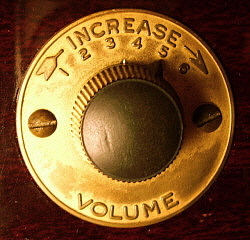 These are marked VOLUME with INCREASE and the arrow along with the numerals 1 through 6. The other escutcheon is marked FILAMENT with INCREASE and the arrow along with 0 for the OFF position and 1 through 5. These escutcheons are found on the Synchrophase receivers up until the engineering upgrades of 1925. NOTE: It's been reported that MU-1 JRPI has FILAMENT-INCREASE for both escutcheons. Also note in these photos of the escutcheons that the faux mahogany bakelite is mottled grain on the earlier panel to the left and is linear grain faux mahogany on the just slightly later panel to the right. The front panel is made out of bakelite with the front side faux wood grained to look like mahogany. Sometimes the faux pattern appears "mottled" to simulate burl grain and sometimes the grain pattern appears linear. This seems to be variations in the manufacturing of the panels because there is no consistency with both linear and mottled panels appearing throughout production of the Synchrophase. 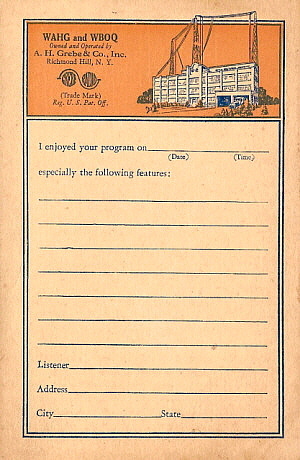 The early Hook-up Cards are cream colored stock with black lettering and drawings. Note that the underside Hook-up Card shows that the B batteries consist of four +22.5vdc batteries to provide the +45vdc and +90vdc required. Also shown is a horn speaker representation for the loud speaker hook up. Early Instruction Cards are cream colored stock with black lettering. The representation of the receiver's front panel is very large with all of the controls plainly identified. There is a list of accessories required that names the tubes needed, batteries, loud speaker and antenna. There is also a tuning log that was filled out at the factory and shows the exact dial settings for specified wavelengths. Note that the round escutcheons on the card only have INCREASE on them. Additionally, the serial letters are written in an area in the upper right hand corner of the card. The system works from the central dial which has two drive sprockets mounted on top of the dial. From the central dial out to each of the other tuning dials a ball-chain is mounted to sprockets that are mounted on top of those dials. The central dial thus drives the two outer dials via the chains. If individual dial tuning is desired, the knurled nut on top of the outer dial sprockets can be loosened and then that sprocket will not turn that dial. The user could also use the knurled nuts to disengage the outer dials, then precisely tune in a station and then tighten the knurled nuts and the receiver was then "calibrated." Additionally, there was always a bit of play in the chain coupling anyway, so minute adjustments could be made for precise tuning. Though the ball-chain drive does pre-date the next upgrade, not many (if any) Synchrophase receivers were built with the ball chain drive but without the Low Wave Extension Circuit. 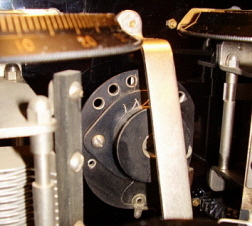 photo above: Grebe MU-1 SRSS shows the chassis layout after the mid-1925 upgrade showing the addition of ball chain drive for single-dial tuning. The band switch is directly behind the left dial and the center dial. Note that the switch is activated by a lever that exits from under the rear of the center dial and engages the switch slide through a slot. By 1925, the Department of Commerce had already been moving stations up to the higher frequencies of the "unofficial BC band." As a result, the early Synchrophase receivers that only tuned up to ~1300kc were now not able to tune in these newly licensed stations and other licensed stations that had been moved because of frequency conflicts with nearby stations. What Grebe needed to do was increase the tuning range of the Synchrophase and this was accomplished in an innovative manner, typical of Grebe. The addition of a band switch that shorted out coil turns to increase the highest resonant frequency allowed the new Synchrophase to tune in two bands from 550 meters to 240 meters on the high range (longer wavelength) band (545kc to 1250kc) and from 250 meters to 150 meters on the low range (shorter wavelength) band (1200kc to 2000kc - NOTE: most MU-1s tune to about 1900kc.) Certainly enough frequency coverage to cope with any new expansion of the Broadcast Band. 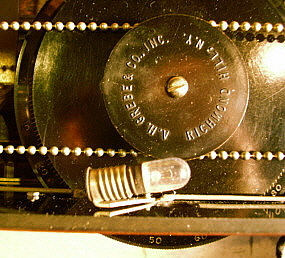 The band switch was operated by a lever that was activated as the central tuning dial approached either end of travel. At just past "100" the user would feel the switch engage in that direction. Just past "100" will engage the band switch to the high range wavelength position or tuning from 545kc up to 1250kc. Tuning the central dial to just past "0" and the user would feel the band switch engage into the opposite position, or the low range wavelength, tuning from 1200kc up to 1900kc. The band switch and tuning range extension was the major improvement for the Synchrophase receiver changing it from essentially an early-design TRF receiver to a very flexible, wide range receiver. This innovation combined with the other improvements for 1925 put the Grebe Synchrophase far ahead of most of the other radios of the day with the only superior performance coming from the RCA superheterodynes. 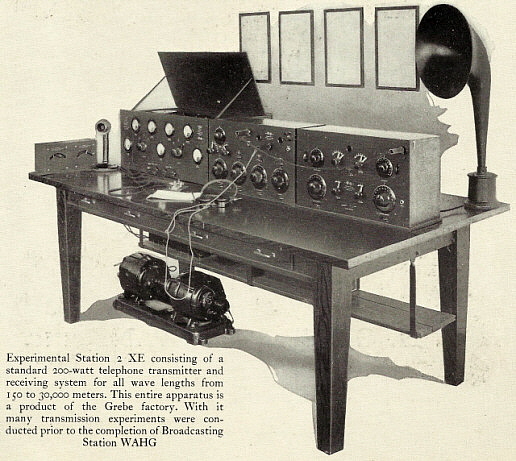 The Low Wave Extension Circuit was first advertised in September, 1925 but the patent was filed on January 30, 1926. The mid-1925 upgrade completely revamped the way the VOLUME control worked and eliminated the FILAMENT control altogether - well, not quite. The new VOLUME control took the place of the old FILAMENT control in that using the tube filament voltage became the control of the receiver output level. The single filament variable resistor was replaced with a dual resistance unit. This dual control is connected so that the A battery voltage first connects to the end of one adjustable resistance. The arm of the dual resistance unit is a common mounting dual arm that contacts both resistances but with a single connection. 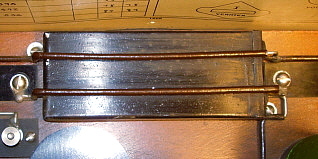 The output for the two RF amplifier tubes is taken from the arm connection. This "adjusted RF amplifier filament voltage" is also connected via the arm contact to the second resistance. The second resistance output is off the end of the second resistance and provides a lower filament voltage to the Detector and both AF amplifier tubes. 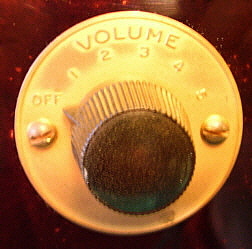 Both voltage outputs are adjusted simultaneously with the VOLUME knob. This allowed a better over-all control of the receiver output since the RF amplifiers ran at a somewhat higher filament voltage that provided better sensitivity. photo above: To create a TONE COLOR control from the old VOLUME control this series capacitor was added. It is mounted under the 1st RF Amplifier tuning condenser. Another new addition was the TONE COLOR control. It actually used the six position (five levels - one off) tapped resistor of the old VOLUME control which was still connected exactly the same way that it was as a VOLUME control, that is, across the second audio interstage transformer primary but with one important addition - a series capacitor. The capacitor was located under the 1st RF Amplifier tuning condenser and consisted of a bakelite tube that had the 0.5uf capacitor waxed in place inside. A metal band mounts the capacitor to the chassis board. The series capacitor isolated the shunt and it became a variable RC network that was now able to roll-off the high audio frequencies (although Position 6 disconnected the RC shunt allowing a somewhat "flat response.") Switching in the various stepped positions of the TONE COLOR might be perceived as "mellowing the tone" depending on your speaker. 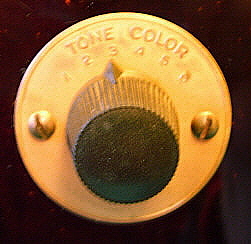 Grebe advertising claimed the user could adjust the TONE COLOR to enhance specific instruments or music to the taste of the listener, however, a good imagination certainly helped. HOOK-UP CARD - Around the time of the mid-1925 upgrade, the Hook-up Card that is underneath the cabinet was changed. The earlier Hook-up Cards showed four +22.5vdc B batteries connected in series to provide +45vdc for the Detector and +90vdc for the RF and AF amplifiers. The earlier cards are cream color with black lettering. The new Hook-up Cards now show two large +45vdc B batteries connected in series for +45vdc and +90vdc. All other information is basically the same as the earlier cards. The new cards are light yellow with black lettering. INSTRUCTION CARD - The new Instruction Card was black printing on glossy yellow stock. The size of the front panel representation was dramatically reduced and the nomenclature on the drawings of the escutcheons was changed to reflect the updates. The log of tuned wavelengths has both low and high range settings. The list of accessories was changed to reflect the recommendation of two large +45vdc B batteries instead of four smaller 22.5vdc batteries. Serial letters remained in the same location. DIAL LAMP - As RADIO evolved in the mid-1920s, it became popular to add as many "extras" as possible to enhance a radios performance or appearance. 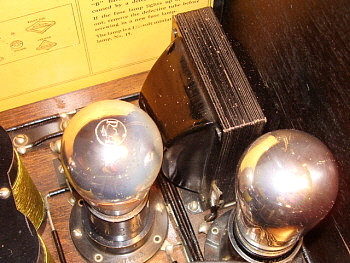 Dial lamps were certainly not a necessity but did provide a visual indicator that the radio was turned ON. In fact, the Grebe manual lists the lamp as a Pilot Lamp or Dial Lamp, either one. A spacer was added under the center dial escutcheon to allow the light to fall onto the dial during operation. The lamp operates off of the Detector/AF amplifier tube filament voltage, something around 4vdc to 5vdc. The lamp has a threaded base and a #40 lamp (6.3v) will operate fine and draw less than 155mA of current. BINOCULAR COIL ID PLATE - These plates identifying the Binocular Coils as being a trade mark that is registered and that a patent is pending on the coil design show up installed on top of the bakelite cap around mid-1925, approximately coinciding with the major upgrade. Earlier Synchrophase coils do not have any identification plates on the coils. These ID plates, though certainly on nearly all post-upgrade Synchrophase receivers, are not on all of them. Missing plates might have been a stock problem with the plates being out of stock for a short time. Most companies wouldn't hold up production due to the shortage of an unnecessary item. BYPASS CAPACITORS - The early bypass capacitors for B+ and C- are long thin units that are painted gloss black. 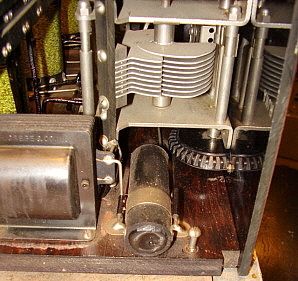 Somewhat after the major 1925 upgrade of the ball chain drive and band switch, perhaps early 1926, the bypass capacitors were changed to a more square shaped unit that is usually painted satin black. The buss wiring is Ground to C- and B+ to Speaker connections. When the AF B+ was raised to +135vdc, the buss wires are no longer routed over the B+ Bypass capacitor because the Ground connection was then moved directly to the C- terminal. It's doubtful that this component change was really an engineering upgrade. It's more likely that a different supplier was found for the bypass capacitors that provided better quality or a lower price per unit - maybe both. The C- bias bypass capacitor is located under the center tuning condenser. PROTECTIVE FUSE LAMP - This small "flashlight bulb" acts as a fuse in series with the B+ line of the receiver. 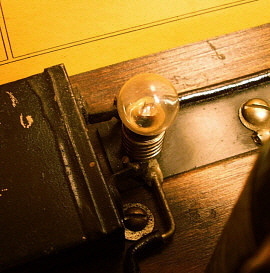 If the B+ becomes momentarily shorted this lamp will instantly "blow" and open the connection and remove the B+ from the short circuit. Such shorts could be from a defective vacuum tube that has a plate to grid short or plate to grid and filament short. Either case could cause severe damage to components in the receiver. Heavy jarring, like slamming the radio lid down while the radio is in operation could cause an internal tube short with resulting damage if it were not for the fuse-lamp. Any flashlight bulb from 1.25 up to 1.5 volts that has a screw base that fits the socket is usable for the fuse application. If you don't have a fuse lamp, the Grebe manual says the dial lamp can be used as a temporary fuse to power the receiver. After the mid-1925 major upgrade it didn't seem that there was much else that the Synchrophase needed. However, one area of improvement that was happening in late 1925 through 1926 was the introduction of high impedance magnetic cone speakers. The horn speaker had been very popular from the very early twenties but its sound reproduction was limited. Not that loudness couldn't be had from a horn speaker. 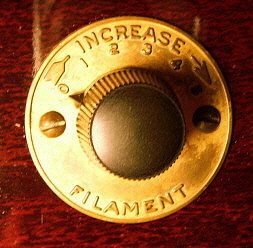 Many brands that had direct-driven diaphragms were capable of very loud reproduction. However, the frequency response was never very good on horn speakers and bass response was certainly what was lacking. The Hi-Z magnetic cone speaker used a similar driver to the direct-driven diaphragm horns. The drivers were some sort of solenoid coil or coils inside a magnetic field with a suspended metal blade inside the field with an armature-pin mechanically connected to the center of a large paper (or light weight wooden) cone that had no rim suspension. Since the paper cones were much larger than the horn speaker diaphragms, bass was slightly enhanced. Still, since the movement of the metal blade inside the magnetic field was so slight, the large volumes of air needed for true bass response from a paper cone was certainly still lacking. But, that's by today's definition of bass response. What did the average radio listener have to compare his radio sound reproduction to? Acoustically recorded music played on acoustic reproduced playback machines - Victrolas! Though entirely mechanically driven, the Victrola soundbox (aka: reproducer) functions exactly the same way as a horn speaker driver - the movement of a diaphragm with a horn attached to acoustically amplify the sound. No wonder the horn speakers sounded almost like Victrolas. Well, most average cone speakers sounded as good as a well-adjusted Victrola so that was an improvement over horn speakers. Grebe, though, wanted to improve the lower audio reproduction of the Synchrophase and that was going to require more audio power, so, in 1926, a "major" upgrade was added. In order to improve the bass response, Grebe first determined where the limitations were in the Synchrophase circuit. The first limitation was the audio interstage transformer coupling that was used to couple the audio signal through the two stages of amplification. Transformer coupling had the advantages of adding gain to the circuit but the disadvantage of requiring high quality construction to have good frequency response. Grebe found that the bass response could be enhanced in the first audio amplifier by using a much larger audio interstage transformer. By retaining the smaller interstage transformer for the second stage the higher frequencies were still present and since the bass had been enhanced in the previous stage, the overall frequency response of the two stages reproduced bass better. Grebe pointed out that now both stages had to be used together and a user couldn't pull the audio from just the first stage. Why this was mentioned is puzzling since the Synchrophase always used both stages of audio amplification and there was no earphone or single stage audio provisions. Maybe he was just making the point that both stages worked together. photo above: The new Low Frequency AF transformer. The DCR on this transformer is 800 ohms and 12K ohms. Along with improving the bass response it was necessary to provide more audio power to drive the new cone speakers to the point where the bass response became apparent. This required a few more upgrades to the Synchrophase. The new UX-112 tube was rated to run much higher plate voltage than the standard 201-A tube. The 201-A was rated at about +90vdc on the plate with about -4.5vdc for grid bias. The new UX-112 allowed raising the plate voltage to +135vdc with about -9vdc grid bias. The UX-112 has the same pin configuration so socket changes weren't required. New bottom Hook-up Cards were necessary showing the new arrangement. Additionally, the ground connection was moved to the -C fahnstock clip and the former ground connection became the new -9vdc grid bias for the UX-112 stage. Since two C batteries were now required, when connected in series, both -4.5vdc for the RF and 1st AF amplifiers and -9vdc for the UX-112 were available. Also, three +45vdc B batteries are specified on the new card to have +135 available. This connection is through the speaker and both one speaker lead and the +135vdc lead are connected to the same fahnstock clip. Additionally, there was an upgrade to the TONE COLOR control that changed it from an RC shunt on the second AF transformer primary to a switched, multiple capacitors to shunt the Audio Output Tube grid to C-. The capacitors would roll-off the high frequencies to enhance the bass. As with the former variations of this control, the highest setting is an "open" position allowing a somewhat "flat" response. These audio upgrades were a major improvement to the overall MU-1 sound. When used with a good quality cone speaker the reproduction was amazing and rivaled the early electric phonograph recordings and playback machines in volume and bass response. The first electric recorded phonograph records were available in late-1925. All of these audio upgrades date from around mid-1926 since the Grebe schematic dated August 16, 1926 has all of these upgrades on it. A Note on the Escutcheons - I recently was able to acquire a 1925 Grebe Radio Brochure detailing the early Synchrophase receivers. In the brochure it is stated that the escutcheons are "dull 24K gold covered." However, the 1926 Grebe Synchrophase manual states that the escutcheons are "gold lacquered." I've noticed some difference with early escutcheons appearing flat without much sheen while later escutcheons seem to have more depth to the finish with a lot more shading and darkening in the edge patterns. It's subtle but is more apparent with side by side comparisons. photo above: The new Hook-up Card for the 1926 upgrades showing the three +45vdc B batteries, a Cone Speaker, new connections for +135vdc B+, new Ground connection location. Additionally, the Instruction Card was updated to reflect the 1926 changes. The new Instruction Card appears very similar to the 1925 upgrade cards with just minor changes. Some newer Hook-up and Instruction Cards were cream color stock with red lettering. Most though are as shown above. With the increased performance level, the way in which vacuum tubes were built began to affect the Synchrophase operation to a certain extent. Early vacuum tubes do not have any support of the internal structure other than the glass stem and the plate support rods. As a result, the structure can move to some extent and sometimes this is heard as a "ringing" or "hollow" sound in the radio speaker. In severe cases feedback may actually occur due to what was called "microphonics." The mechanical vibration induced into the tube structure from movement of the radio case, vibration from the speaker if it is set on top of the radio case or other such inducements can cause feedback due to microphonic tubes. Not all early vacuum tubes are microphonic but many are and the cause was the lack of sufficient support of the internal structure. To reduce feedback and other microphonic noise, Grebe introduced a spring cushion tube socket. For a short period of production only the Detector tube socket was fitted with a spring cushion tube socket. One of the last upgrades to the Synchrophase was to install cushion sockets on all of the tubes in the receiver thus eliminating microphonics from any source. You will find quite a few MU-1 receivers that have the UX-112 and Low Frequency transformer upgrade but still have the bayonet sockets. The time period between the UX-112/LF xmfr upgrade and the installation of the cushion sockets must have been at least a few months. With this upgrade, the Grebe MU-1 continued in production built to this configuration until mid-1927. 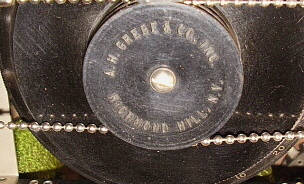 Straight-Line-Frequency "S-L-F" Identification on Chain-Drive Sprocket Caps - The early chain-drive sprocket caps are embossed with "A.H. Grebe Co., Inc. Richmond Hill, N.Y." only. Around the August 1926 upgrade, metal identification plates were installed that have "S-L-F" and patent pending on the plates. The S-L-F plates are mounted on top of the chain drive sprockets on all three tuning condensers. The metal S-L-F plates were used for only a short time and were replaced with S-L-F embossed into the sprocket caps. The embossed cap change appears just after the August 1926 upgrade. Shown below are the three variations of the chain-drive sprocket caps. Since the Synchrophase was an impressive performing receiver and the styling was quite popular it seems natural that owners wanted to keep their MU-1 up-to-date for at least a while. RADIO was so rapidly evolving in the twenties many radios were sold (especially in 1926) that became obsolete in just one year. Though the Synchrophase wasn't quite in that rapidly obsolete category, there were some upgrades that probably were offered by the Grebe factory and by some Grebe dealers to customers who had purchased an earlier model. I also have an early model MU-1 LYWA that has had a modification to use a 71-A tube for the audio output. This installation was not performed by the factory since the modification is very minimal, no Grebe parts are used and the original Hook-up Card is marked with pencil to indicate the -9vdc bias connection. The upshot is that ALL Grebe Synchrophase receivers have to be carefully inspected for components that seem out of place for the vintage of the receiver. The conflicting Instruction and Hook-up cards were obvious on MU-1 RJNA. Also, the early version bypass condenser in conflict with the low frequency AF transformer. Usually, these component timeline conflicts will lead you to discover a dealer modification or a factory upgrade that has been installed. Factory upgrades are usually very high quality rework and difficult to tell from factory original. photo above: 1925 MU-1 RJNA was Factory Upgraded in 1927. The factory added a Low Frequency Transformer, UX-112 tube, +135vdc B+ modifications and Cushioned Detector tube socket. Audio power improvement was the goal. photo above: Inside the early version MU-2. Note that the sockets are for UV-199 tubes - not UX-199. Also note that there are six sockets used in the MU-2. Two parallel 2nd AF Amplifiers. photo above: Early version MU-2 hook-up card. Note that six 1.5vdc dry cells hooked up in series-parallel are required for filament voltage. Also note the four 22.5vdc B batteries used. >>> Note in the hook-up card shown above that there are four 22.5vdc B batteries used to provide +45vdc detector voltage and +90vdc for RF and AF amplifiers. Also, note the six dry cell batteries connected in series-parallel thus providing +4.5vdc A filament voltage. This was then adjusted at the Filament control (early versions) for approximately +3.3vdc required for the UV-199 tube filaments. The 199 tubes were fragile and the Instruction Card warns users about setting the Filament voltage higher than 3.3vdc. It's likely that the minor variations that occurred during the early MU-1 production will also be found in the MU-2 early versions. When the MU-1 was upgraded to the mid-1925 version, the MU-2 followed suit. Later versions of the MU-2 have the band switch and chain drive. Also, a dial lamp, a lamp fuse and a circuit that uses only five tubes. Four UV-199 tubes and one UX-120 tube. The use of the UX-120 required the use of +135vdc B+ with negative 22.5vdc C bias. 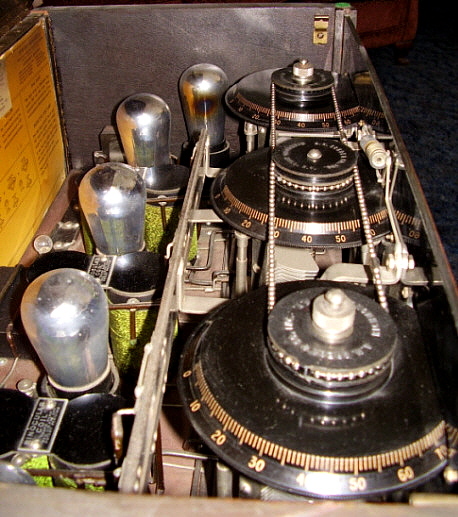 It can be seen that the late-MU-2 chassis used the same size audio transformers. Note in the WKYA photo to the right that the AF transformer in the back right corner of the chassis is the early small size. The larger first interstage transformer was introduced during the mid-1926 upgrades on the MU-1. The smaller first interstage transformer on the MU-2 indicates that while this version of the MU-2 has the mid-1925 upgrades, it doesn't have the mid-1926 upgrades. The mid-1925 MU-2 version may have been the final evolution for the MU-2 since it isn't mentioned in the mid-1926 edition of the Synchrophase manual. photo above: MU-2 WKYA. Note the tubes are four UV-199 and one UX-120. Also, the chain drive is apparent along with S-L-F tags. The photo to the left is of another MU-2, letter code SKHX. Note that the UX-120 tube socket has an opening that is larger than the other sockets that are for UV-199 tubes. The base of the UX-120 tube has a larger diameter due base required to incorporate the longer pins and to have enough strength for the "plug-in" type of mounting. UV sockets hold the tube in place using a bayonet pin on the side of the tube base and a receiving guide in the tube socket requiring a "push and twist" for inserting the tube into a UV socket. In this photo both AF transformers are visible making it easier to see that they are the same size. Also, more apparent in this photo is the larger diameter of the UX-120 tube socket when compared to the UV-199 tube sockets. SKHX is awaiting restoration. As mentioned, the 1926 Grebe Synchrophase Manual doesn't have any information on the MU-2 which implies that, by mid-1926, the MU-2 wasn't being offered anymore. The MU-2 wasn't sold in large numbers. Many users had difficulty using dry-cell tubes. The 199 tubes were fragile and filaments were so fine (for the 60mA current draw) that almost any small mistake would ruin a tube (or perhaps all of the tubes.) The convenience of dry-cells (compared to using a lead-acid automotive battery) off-set their expense in some user's opinions and these people bought the MU-2 rather than the MU-1. The MU-2 versions are so rare that only four have been reported. If you have an MU-2 that differs from the two versions described here, let me know and I'll add the information. Photos are welcome. Thanks to Chris Hollingsworth (SKHX) and Jim McDermaid (WKYA) for the photos of their MU-2 receivers. Some factory options were available for the Grebe Synchrophase. The Battery Base is probably the most often encountered, although it should not be considered a common item. In fact, later on they were far from popular. This was mainly because they were designed for the early receivers that used four +22.5vdc B batteries and one small C battery. For the early Synchrophase receivers, the Battery Base provides storage for the necessary B and C batteries without a problem of the battery height. The lead-acid storage A battery had to be stored elsewhere and just the A+ and A- wires brought in through one of the three eyelet holes in the back of the Battery Base. When purchased, the wires for the B and C batteries were included. During the mid-1925 upgrade, the B batteries specified were changed to two large +45vdc batteries to provide +45 Detector voltage and +90 RF/AF voltage. The large batteries wouldn't fit inside the Battery Base. Since the same voltage was required, if a new owner wanted the Battery Base, he could still fit the four +22.5vdc B batteries inside to power the new MU-1. When the Synchrophase's audio output tube was changed to a UX-112 tube and the plate voltage increased to +135vdc, the required three large +45vdc batteries wouldn't fit into the base (and neither would six +22.5vdc B batteries.) By then, there were smaller +45vdc B batteries available that would fit but their useful life was much shorter than the large B batteries. So, if the Synchrophase owner wanted the Battery Base to be used with the later receivers, they had to use the small, short-life B batteries. Of course, this limited the popularity of the Battery Base and the result is, today, when a Battery Base is found with the Synchrophase radio as a complete original set-up, almost always that Synchrophase is the early type that took four +22.5vdc B batteries. 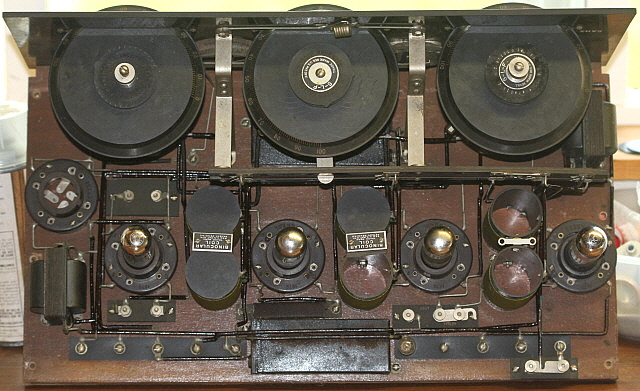 photo above: 1924 Synchrophase MU-1 CTPB with the Battery Base option (an original combination.) Note that the faux grain on this panel is linear. This all original example functions beautifully and is the basis of our "Expected Performance" section below. At $320, the Console Model was expensive - double the price of the standard table model MU-1. This high-end receiver featured Etruscan gold plated escutcheons, solid mahogany floor model cabinet with built-in battery storage and dual speakers - one on each side of the cabinet. 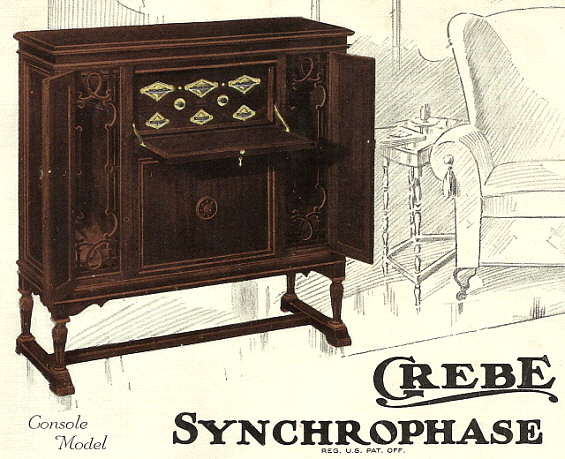 Grebe advertising went on to explain how the dual speakers separated by the width of the cabinet gave the listener "perspective" to the radio reception and compared the set-up to viewing two photos in a stereoscope. Early reference to "stereo" reception? Perhaps,...binaural would be more accurate. There was also a "Polychrome" Console model priced at $340 and from the name one assumes that the cabinet finish was a combination of different shading or coloring. Either of the Console Model Synchrophase receivers are quite rare. 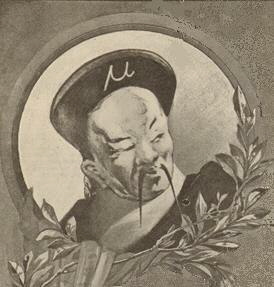 The artwork shown to the left is from the 1925 Grebe Radio advertising brochure. In the twenties most radio enthusiasts were not particularly interested in the quality of entertainment that was being broadcast. They were interested in how far away the station they were receiving was. DX, or distance, was the topic of discussion and boasting between the radio enthusiasts. To enhance your boast it was always helpful to have a confirmation of reception from the DX station you received. The procedure to acquire a return confirmation, or QSL, was to write the station you received and tell them in a letter the time, frequency or wavelength, date and a description of the program. Real enthusiasts might also mention receiving conditions, such as, static or fading and the type of receiver used. The idea was to provide the broadcasting station with useful information that would then inspire them to send you a confirmation. 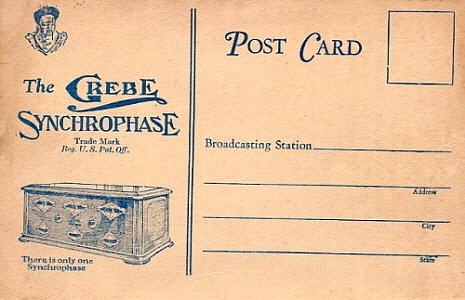 Grebe actually supplied a printed post card QSL that was ready to fill out and send off to received broadcast stations. Hopefully, the card would impress the station to the point that they would reciprocate. 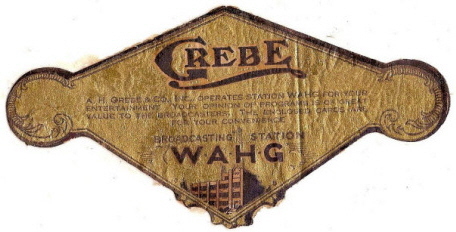 Grebe also used the card for advertising purposes, showing a Synchrophase and "Doctor Mu" on one side and WAHG and WBOQ Grebe's BC stations on the other side. photo above and top right: The Grebe QSL card. The card design did change somewhat from time to time. Additionally, some early Grebe receivers will have a gold colored label in the shape of the tuning dial escutcheons glued to one of the inside walls of the Synchrophase. These labels advertised WAHG and the fact that the Grebe QSL cards were included with the purchase of the Synchrophase. The installation of these advertising labels at assembly must have only lasted a short time as they are not found very often and are usually on late 1924 versions of the Synchrophase. Grebe advertising spared no expense to convey their message that Grebe used the best parts in the best circuits with the highest quality construction and that naturally resulted in the best performing radio equipment available. The 1925 Grebe Radio brochure is a very high quality book that not only shows the various models of the Synchrophase that were available in 1925 but also contains several photos of earlier Grebe radios. The booklet is printed in multiple colors and the artwork for the various Synchrophase models are shown in brown and gold tones. 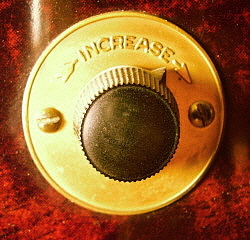 Typical of Grebe operator's manuals, whenever an escutcheon is pictured, it is shown in gold. The centerfold is a brown and gold depiction of the Synchrophase with the Battery Base option. Shown to the left is the cover which has "GREBE" and "RADIO" actually embossed in the heavy paper cover. The photo to the right is of Grebe's experimental station 2XE which shows the CR-6 and CR-7 receivers along with a Grebe-built 200 watt transmitter that is powered by batteries and the motor-generator set under the table. The horn speaker shown is a Western Electric 10-D horn.